HIROSHIMA - An atomic bomb survivor on Thursday recounted what she experienced during the U.S. attack on Hiroshima and called for the abolition of nuclear weapons in comments made to members of the British Parliament via the Internet telephone service Skype. According to the Hiroshima Municipal Government, this was the first time testimony related to the atomic bombing has been delivered via Skype to the legislative body of a country possessing nuclear weapons. 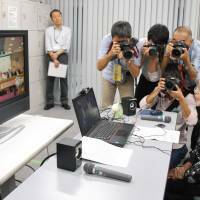 The city of Hiroshima has offered people abroad the opportunity to listen to the stories of survivors and have direct exchanges with them through Skype for five years. Participants have generally been schools and churches. 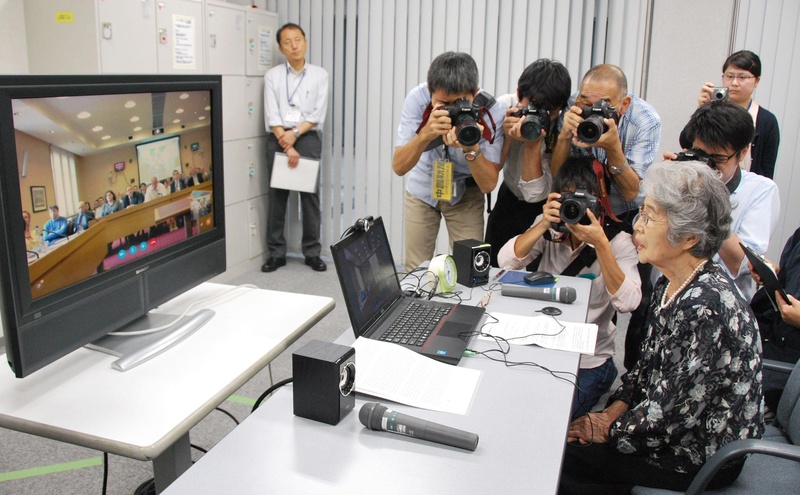 The British Parliament event came about after a person working in the House of Lords visited the secretariat in Hiroshima of the Mayors for Peace — a global organization of cities seeking a nuclear-free world — last spring and showed an interest in the Skype project. Yoshiko Kajimoto, 84, recounted her experience to about 70 people in a committee room inside the Parliament building in London. John Laird, the event organizer and a member of the House of Lords, said he was moved by Kajimoto as she spoke while appearing to repress her feelings. Kajimoto was 14 years old when exposed to radiation while 2.3 km from ground zero of the atomic blast. She was working in a military factory, helping to make airplane propellers. A Hiroshima official said that having parliamentarians of a nuclear weapons state listen directly to the experience of an atomic bomb survivor was a “landmark” event. “We hope this will raise awareness about the abolition of nuclear weapons,” the official said, noting this year is the 70th anniversary of the U.S. atomic bombings of Hiroshima and Nagasaki. Unlike the elected House of Commons, members of the House of Lords are appointed and the majority of its members are life peers. According to the Hiroshima Municipal Government, survivors have spoken about their A-bomb experiences via Skype at events in 16 countries, including the United States and Russia.